In GreenPhoton’s blog posts above, you will find that he recompiled USBasp with those changes and provided the HEX file. So I grabbed my 3 ½ year old project and imported it into the 3 versions newer Atmel Studio 7. Compiling showed a couple of errors and warnings caused by the newer configuration settings and the newer, more picky version of GCC, but finally it compiled through now for the ATmega88. Here instead, I shall just suggest a very simple patch to the HEX file compiled by USBasp’s author himself. Essentially, we just want to modify the DDRD value to make PB2 and PB3 inputs instead of outputs. With these simple changes made to the HEX file, you can now use this updated file to be flashed into the programmer. Either that, or you can compile USBasp yourself. I have tried this as well and it wasn’t too difficult — you just need to sprinkle some const keywords in usbdrv. [ch] and it will compile cleanly with avr-gcc. You can upload a sketch to an Arduino to make it act like a programmer. (I assume you do have an Arduino lying around somewhere?) This programmer is supported by avrdude, so you only need the Arduino IDE to upload the sketch. The good thing about the Arduino IDE is that it comes with avrdude and avr-gcc as well, so no other additional downloads are necessary. I unzipped the Arduino IDE zip file into C:\. You can find the avr binaries under hardware\tools\avr\bin, and the avrdude.conf resides in hardware\tools\avr\etc. You can either go to the bin directory to run avrdude, or you can add the bin directory to your %PATH%. The same can be applied to the Linux and Mac versions (I think). The USBasp programmer was designed to be programmed via the same port it uses to program the target. All the ICSP pins are connected through, except for RESET, which is used to control entry into programming mode. That pin can be connected to RESET via a jumper when programming is required. Use the Arduino IDE to upload the modified sketch into your Arduino. After you are done, close your Arduino IDE, in case it also tries to open the serial port. 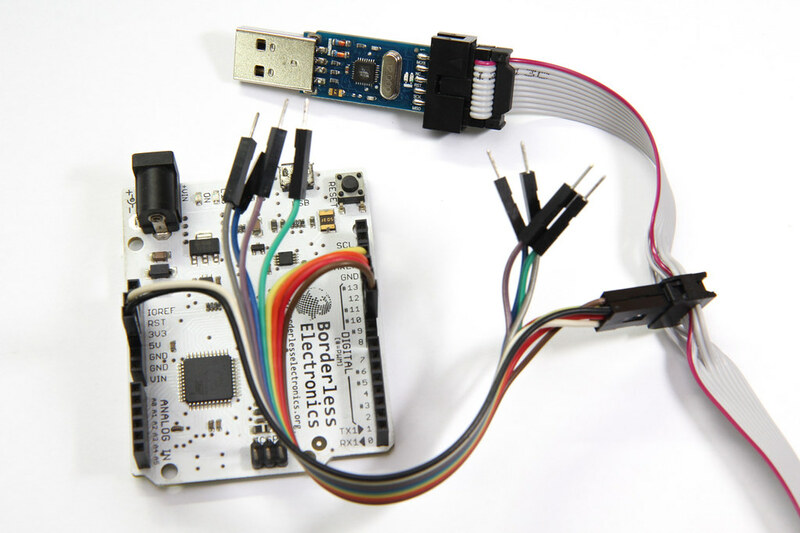 You should then wire up your Arduino to the programmer’s ICSP connector by following the code in the sketch. This is where the pinout diagram imprinted on the case comes in handy. Also, remember to hook up Vcc and GND, so you should have a total of 6 pins connected. Here, I have spliced a 6-pin IDC connector into the provided programming ribbon cable. You can more easily connect to “standard” 6-pin ICSP headers that way. For the final step, you will need access to the programmer’s PCB to enable self-programming. Insert a wire to bridge the --> UP <-- holes as indicated on the rear of the programmer board. That will bridge the RESET on the programming header with the RESET on the ATmega88 to allow it to be programmed. The PCB holes are so small that I had to use AWG 30 wire-wrapping wire. Now, verify that your Arduino programmer is working by running the following avrdude command from the bin directory. Use -P to specify your serial port, which in my case is COM15. If you are using an Arduino Leonardo as your programmer, you should specify -c arduino, but if you are using an Arduino Uno, you will instead need to specify -c stk500v1 -b 19200. If avrdude can successfully read the device signature and identify the target device properly, it means that the programmer is working. Here, despite me specifying the part as an ATmega328, it still correctly detected the device as an ATmega88 (m88). If you get a 0xffffff or 0x000000 device signature instead, your programmer might not be working correctly. Check your wiring to ensure you have the connections right. Now using avrdude, your Arduino should be able to read the device signature and fuses. The zhifengsoft programmer already has the correct fuses programmed in, so nothing needs to be changed. Refer to the USBasp README to find out what are the lfuse and hfuse values to use for different processors. where usbasp.atmega88.2011-05-28.hex is the path to the HEX file you have just patched above, and i stands for Intel HEX format. After programming is complete, your programmer should now have the blue LED lit to indcate it is powered on. When there’s activity, the red LED will flash. 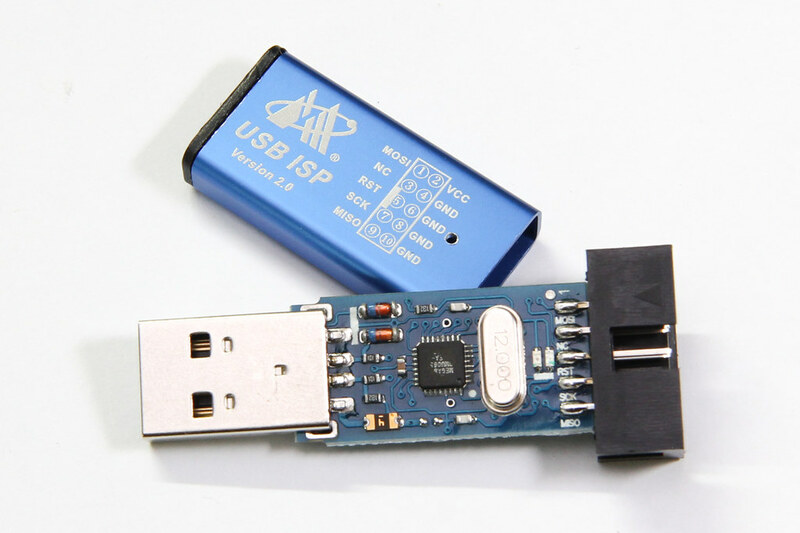 Plug in the programmer into a USB port and verify that it can be detected by the OS. If the OS does not detect your programmer, it could be that you flashed the wrong HEX file without the updated DDRD value. Congratulations, you are now the proud owner of a USBasp programmer. This entry was posted in electronics and tagged arduino, atmel, teardown. Thank you for making this post, as I am now a proud owner of a usbasp. Got stumbled a little bit at the reprogram part, avrdude recognize m328p not m88p. But you can just add more parameters to avrdude to make it recognize the chip. Hi Raj, yes, you can cut the PCB track but some people (like me) prefer a software-only fix. That way, it would still be possible if you ever need to undo the “fix”. Thank you very much, this tutorial is very usefull and is working. Many thanks for this very useful information. Your way is the best solution, I tried it and it worked from the first try. That sounds like avrdude is actually trying to program the Arduino board instead of the USBasp programmer. You can check by disconnecting the ICSP connection to the programmer and avrdude should complain because it now can’t find the chip. If it still reports something when the Arduino is not connected to anything, it means avrdude is talking to the ATmega328 on the Arduino itself. Yeah, you are right, arduino still detect atmega328p after disconnecting the USBasp. also tried with an atmega16 just to upload a simple blink hex file,same issue as before. Me too. please tell me how to solve this problem. i will very grateful. I have tested with an Arduino Uno and realised that the avrdude command needs to modified slightly. I’ve updated the blog post accordingly, and it should work properly now. Let me know if you are still having problems. I want to transform a clone fischl in zhifengsoft prog. Because to me work fine this. After i wrote fischl with zhifeng firmware said “unrecognized device” What’s the hardware difference between that two programmers? See the diagram above. You likely need to connect PD3 to D- on the USB. I’m assuming the Zhifeng programmer drives PD3 instead of PB0. I used an ohmmetter ant tested: on both pcb PD2 (pin 32) is connected to D- (pin 12). 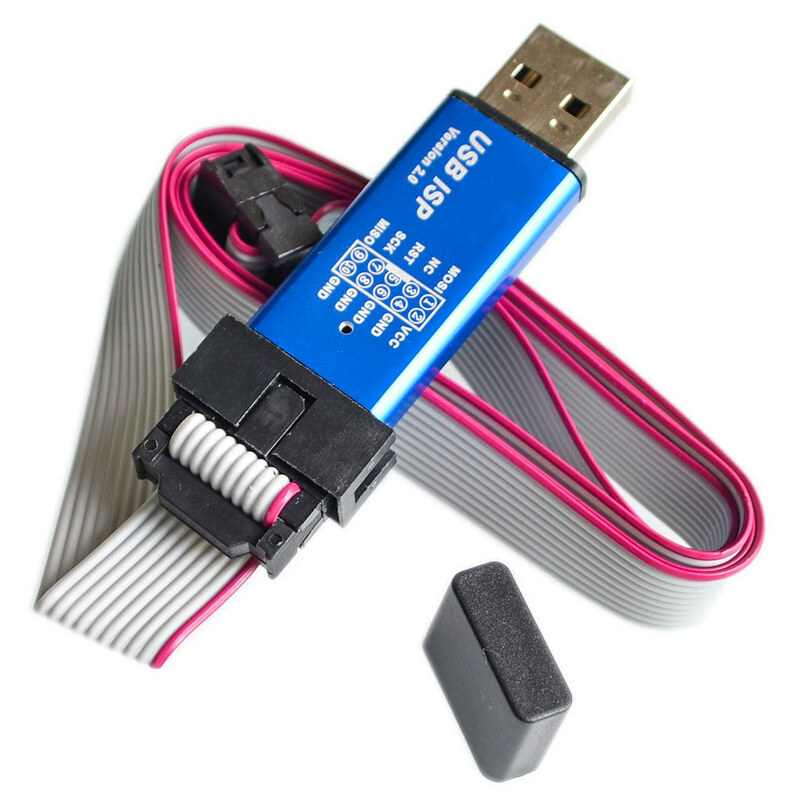 The D- pin I was referring to is to the USB connector, not on the ATmega. Refer to the schematic diagram in the post above, the missing connection I’m talking about is the dotted line in blue. If you need to compare, the fischl schematic is available at https://www.fischl.de/usbasp/. You will see that the connection is not present. Yes, i understud. 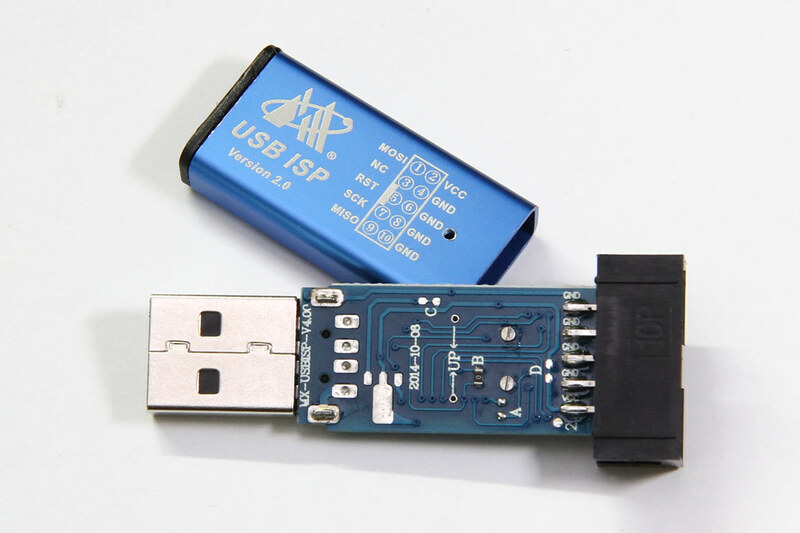 But on both PCB (Fischl and Zhifeng) only ONE of pins USB is linked at 2 pins of Atmega. The link you purpose is not present neither on Fischl or Zhifeng. If can and is usefull, see the link with firmware Zhifeng read from programmer. That can’t be true. The whole purpose of this post was to make the Zhifeng clone work with the original Fischl firmware, and the main reason why it doesn’t work is because there is an additional link on the Zhifeng clone, the one that was highlighted in blue. That additional connection prevents the Fischl firmware from working. If the link is not there, then you won’t need to do anything at all — just flash the Fischl firmware and everything would work. Nobody would need to refer to this guide, and nobody else would have needed to write any guides. I will try to extract schematic from both PCB and compare. A little difference exist: After i reflash Fischl with Zhifeng, the RED LED is ON instead GREEN LED. The rest of differences will see. 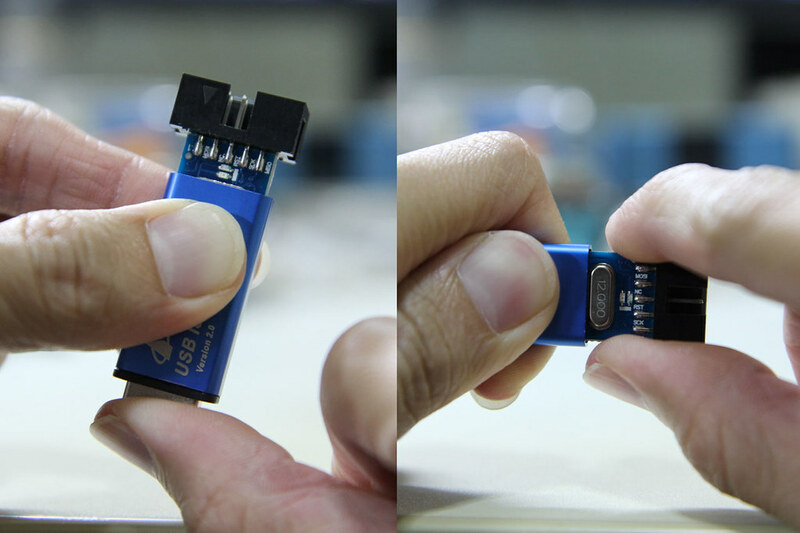 As you can see from the above, wiring of USB D- is totally different than the original. I think, I should do a “clean” compile from the original source with modified pin bindings – I will try it soon. That’s interesting, thanks for sharing! I’m assuming this is the same problem as what Liviu was facing as well — basically the USB pins are connected to different pins that what we expected. Changing the code to reflect these new pins in the fischl firmware should work. Well… Yesterday night I had time to analyze the problem with my dongle. Further investigations were made about pin mappings. First of all I noticed, that pinout of Atmega88 was suspicious in the document that I found first (http://ww1.microchip.com/downloads/en/DeviceDoc/Atmel-7530-Automotive-Microcontrollers-ATmega48-ATmega88-ATmega168_Datasheet.pdf): pin9 and pin12 are both marked as PD5. Double checking it from documents available on Microchip’s ATmega88 product site pointed to the mistake: pin12 is PB0 indeed, so my circuit pinout is the same as it was described in the article above! That’s why the modified hex firmware should have been worked. After clarifying pinout I downloaded the original USBASP firmware source and made a fresh compiled version of it for ATmega88, but it did not work too. Today morning I modified the USBASP firmware source files to do an endless pin-testing loop on the LEDs and USB data lines. Unfortunately, during flashing the dongle, mega88 started not responding at a point. After it I could not talk to this mega88 at all. Maybe this was really not a 100% part before, it could have caused the weird behavior. I took the 2nd dongle (I never buy only 1 pc of any part from China…) and uploaded my pintesting firmware on it. It was running well, all of our pins were waggling as expected. After pintesting I had uploaded the freshly compiled USBASP firmware – of course, port initialization was modified according to extra D port pins connected to USB data lines. The firmware runs well on 2nd dongle, it is stable and fully functional. The ver5.00 hardware not differs from earlier ones (sorry for mistaken alert), it can run modified mega88 hex firmware as it is discussed in the article. One of my two dongles likely was not a 100% condition one, causing the unexpected behavior. On both v5 PCBs I got there is a zero-ohm resistor forming the bridge between PB0 and PD3. Just remove the resistor and flash the USBasp firmware. It works, thanks for this nice share. is there a downloadlink for the correct hex file? Hi edensan, I did not provide a modified hex file because it is quite simple to do it yourself. The original hex files are at the USBasp site here. Download the compiled hex file from there and use Notepad to make the one-line change accordingly. If you don’t want to do this yourself, you can also download a different compiled version from the GreenPhotons blog, which should also work the same. Hope that helps.